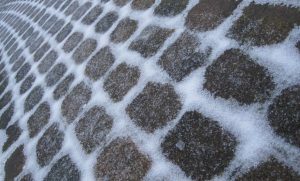 Throughout Autumn and Winter low temperatures and conditions such as heavy rain; ice and snow can take their toll on the toughest of stone surfaces such as the driveways; patios and paths around your home, so here are a few handy maintenance tips on how to prepare for the adverse weather ahead, and how to keep your hardstanding areas ‘spick and span’. If you have natural stone driveways; paths; and patios that you are proud of you should tend to them regularly to keep them looking pristine and a basic task is to keep them swept clean. Sweeping the stone surface not only gets rid of the general rubbish; grit and grime, it removes dead or dying vegetation and plant seeds which if left there can become slippery; start to stain the surface and in the case of the seeds they can propagate and cause weeds to grow. No1 is keeping them swept clean and free from accumulated debris. Summertime fun can give patios and paving a hard time, spilled drinks and oil from BBQ’s etc. can start to make them look a little ‘ropey’ and so in this case brushing alone might not be enough and you might need to consider something like a jet-wash to help. A jet washer can be a great way to keep your stone surfaces clean, but we would suggest testing on a small area that is out of the way first as some jet washers are very powerful and have the ability to cause damage to the surface and especially the mortar pointing between the slabs and cobbles, so where possible; keep the power setting low and keep the spray angle at an obtuse angle i.e. don’t aim the jet square at the surface. Also; don’t spray directly down the joints between the stone flags as you could ‘blast-away’ the pointing. As stone is a natural material; if left unattended it can be susceptible to algae, mosses and lichen growth; particularly if leaves are left to stand on the paving. Algae spores are happy to colonise the surface of stone; turning surfaces a mucky green colour and any such colonised stone surfaces can become very slippery and potentially dangerous. Whilst some people promote the use of bleach to deal with this problem BEWARE as spills and splashes can potentially harm those using it and as bleach kills the algae and organic habitants of your stone slabs it WILL also kill your bedding plants if you get too carried away and ‘splash it all over’ (Henry Cooper reference for those of a certain age who remember the BRUT aftershave adverts! )… so if you’re going to use bleach BE CAREFUL. Our favourite trick, which you don’t hear of much is BIOLOGICAL WASHING POWDER… the key here being the ‘biological bit’ i.e. kills living organisms like algae. So get yourself the cheapest, biggest box of biological washing powder and sprinkle it on your stone surfaces; preferably when they are damp, and then brush the washing powder into your flags with a stiff brush and then leave in place to do its work, then gently rinse it off with hosepipe and stiff brush a couple of hours later. BINGO! Perfect conditions for applying the biological washing powder are when it ‘drizzling’ with rain… sprinkle the powder – work into the surface with a stiff brush – sprinkle a little more as required – work with the brush again from one end to the other creating a slight ‘foam’ – go over the area with the brush two or three times – leave the powder in place – let the drizzling rain rinse the powder away slowly – brush any remnant ‘soapy’ areas again an hour or two later – all the powder will disappear and will be doing its job biologically. This is our preferred method because if you are too quick to rinse the powder off the stone you might not have allowed it enough time to do its thing biologically…so just leave it there and let it disperse…Simples! ON top of the moss; lichens and algae; during Winter months if you allow snow and ice to build up things can be even worse! Clear and sweep thoroughly to remove debris; spillages and stains as well as weeds and debris from the gaps between paving. Check for cracks and holes and then fill them in accordingly. Remember – BIOLOGICAL washing powder! If you’re looking for high-quality stone paving for the home, call us today on 01254 233227 and we can help and advise on our range of products and delivery options.